Another extremely rare record, this is a live field recording. Not as noticeable as two other records located here, Recording Blanks which you may have visited, there is a drive pin hole noted by red arrows. Under those handmade labels you can see "Audiodisc Recording Blank" which indicates this record dates circa 1920 - 1930. This record, like those two other records, is a master recording and possibly the only recording in existence. Unfortunately there are no song titles available. Looking at those labels, clear to see the creator experienced difficulties typing "Soundchief Singers" on either side. 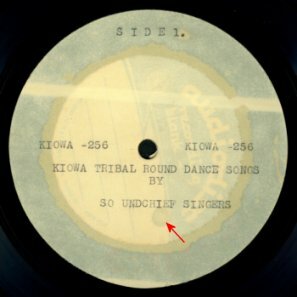 Unlike those two other records, this record appears to be produced by an American Indian interest rather than anthropologists or ethnologists. 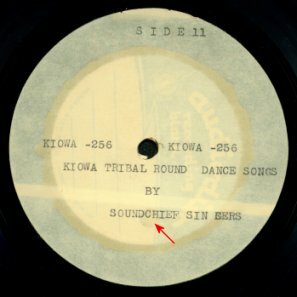 I believe this record may have been cut by "American Indian Sound Chief" a company which recorded many songs of many tribes. These type of records are recorded live in the field. Rather than have select tribes travel to a central production facility, perhaps in Los Angeles or Santa Monica, portable recording equipment is taken to tribal lands. Click on a feather to listen! A new browser window will open for you.